A rugged, ultra-powerful spotlight with long battery life. 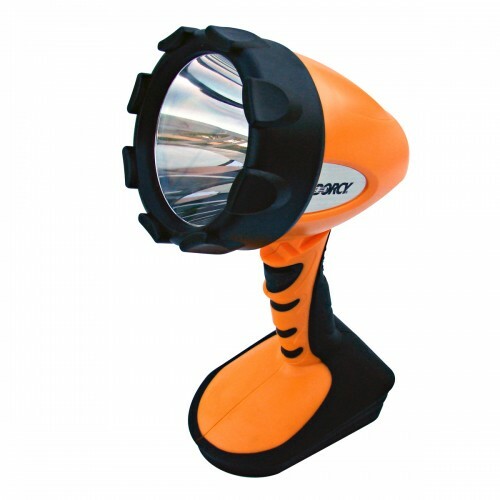 The Dorcy 41-4296 LED Spotlight features a super bright, high powered Cree solid state diode for 500 lumens of light output and a 587 meter beam. Its ergonomic design makes it easy and comfortable to handle, while its flat base allows the light to stand on its own, for hands free use. A vertically swiveling head makes it easy to position the light exactly where you want it. Plus, an impressive run time of 5.5 continuous hours on 4 C cell batteries makes this spotlight a great value. The 41-4296 also features a patented heat transmission / circuit protection system, weather resistance, rugged construction, and comes complete with 4 C cell batteries.